Parents who teach their children gospel values help prepare them to live fuller, more rewarding lives. Through my years working as a trial attorney, I have represented many criminal defendants in their late teens or early 20s who did not understand how they ought to live. In most cases their early years were devoid of love, appreciation, or the teaching of values. They had not been taught by their parents the things they needed to know to make good decisions. In the Book of Mormon, Enos writes that while hunting in the woods he became seriously concerned about his spiritual condition and so began to reflect upon the teachings which he had “often heard [his] father speak concerning eternal life, and the joy of the saints” (Enos 1:3). He sought a sure knowledge from the Lord that his sins were forgiven, and through prayer he received that assurance. Thanks to his father’s teachings, he knew where to go to find peace. The scriptures tell parents that they are here not only to learn similar lessons by experiences but also to share that knowledge with their families. In the Doctrine and Covenants we read, “I have commanded you to bring up your children in light and truth” (D&C 93:40). Like Enos’s father, we have an opportunity to teach our children gospel principles that will lead them to the path of safety and happiness during their lifetimes. But what should we teach? Following are four of many lessons parents can teach that may help their children lay a foundation for learning how they ought to live. President Gordon B. Hinckley said: “We are all inherently lazy. We would rather play than work. … But it is work that spells the difference in the life of a man or woman” (Teachings of Gordon B. Hinckley , 705). In our world today, many people are unwilling to work hard and to render an honest day’s work for an honest day’s pay. Yet we read in the scriptures about the Apostle Paul, who earned his living as a maker of tents (see Acts 18:1–3); Simon Peter, who labored as a fisherman (see Mark 1:16–17); and even of the Savior, who spent His early years as a carpenter (see Mark 6:3). Paul wrote to the Thessalonians “that if any would not work, neither should he eat” (2 Thes. 3:10). Failure to teach children to work may tempt them to look for easy pathways in life. Such pathways more often than not lead downward. There is dignity in a job well done. Elder L. Tom Perry of the Quorum of the Twelve Apostles taught that “teaching children the joy of honest labor is one of the greatest of all gifts you can bestow upon them” (“The Joy of Honest Labor,” Ensign, Nov. 1986, 62). Ours is a world in which some make a mockery of spiritual things. “A great man is reverent,” wrote President David O. McKay (1873–1970). “He reverences Deity; he reverences all things associated with Deity. … Reverence for God’s name should be dominant in every home” (Gospel Ideals , 226–27). “And because of this their great wickedness … they were left in their own strength … until they had lost possession of almost all their lands” (Hel. 4:12–13). Parents can learn from the Nephite example. In our daily speech and conduct, we can exemplify reverence. The flippant and irreverent use of God’s name must be avoided. Even though the world chooses not to live this principle, as Church members we must strive to do so. Establishing habits of reverence for Deity in our homes and with our children helps establish patterns of respect for everyone. We live in a world where knowledge and secular education are readily available. But we must never forget the inestimable worth that a knowledge of the scriptures can be in the lives of our children. During the early years of his life, Timothy was brought up in the faith of his grandmother Lois and his mother, Eunice (see 2 Tim. 1:5). The Apostle Paul later wrote to Timothy “that from a child thou hast known the holy scriptures, which are able to make thee wise unto salvation through faith which is in Christ Jesus” (2 Tim. 3:15). Timothy’s training and home life paved the way for the consecration of his life to the service of Christ. Through diligent study of the scriptures, our children too may develop the spiritual tools necessary to embrace the gospel of Jesus Christ and fill their missions in life. As they do so, they will be blessed with an understanding of the purpose of life and will learn how to make righteous decisions. Some of our most memorable spiritual insights come as we render service to others. As a new convert, I had been called to serve as a stake missionary and also as the ward mission leader. One weekend was particularly draining. Late Saturday night I was awakened by a telephone call requesting that I administer to a sick member. I didn’t return to bed until early Sunday morning. Then I had a meeting at 7:00 A.M., taught a priesthood class, and finally attended a baptismal service. By Sunday afternoon I was exhausted. I went home, crawled into bed, and pulled the covers over me for a short nap. Then the telephone rang; it was the elders quorum president. He needed me to go with him to visit a home where the parents were having a terrible fight. Because of my exhaustion, my reply was less than enthusiastic. A few minutes later the bishop called me. He told me he felt impressed that we should go to the home immediately and stabilize the situation. Once we arrived, we found the reports to be accurate. The situation was terrible. Furniture and dishes lay broken everywhere. Clothing was strewn on the floor, and the children were huddled in corners crying. Priesthood leaders counseled the couple throughout the night. Meanwhile, the children, with help from their grandmother, worked through the night to clean up the house. After several hours, hearts were softened and the situation was in control. As I reflected on my attitude that night, I learned a lesson in humility, obedience to priesthood leadership, and the importance of responding to those in need. I have also learned that when parents love others and give willing service, their children see Christ’s teachings reflected in their parents’ lives. These four principles are but a few that parents can teach their children. However, by taking the time to teach such important gospel truths, parents will not only bless their own homes now but also prepare their children with the knowledge of how they ought to live if they would be happy. 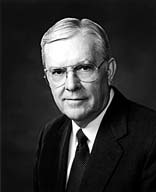 Elder M. Russell Ballard of the Quorum of the Twelve Apostles, “Teach the Children,” Ensign, May 1991, 80. D. Michael Barrett is a member of the Stones River Branch, McMinnville Tennessee Stake.